Austin Macauley Publishers wishes all the women around the globe a very heartiest International Women’s Day, and wish celebration of this day may voice the women’s issue, celebrates the womanhood and bring empowerment to women around us. International Women’s day serves the purpose of highlighting the issues faced by women, making sure we are playing our role in empowering them and highlighting the strong female achievers who lead by example. Late Shaikh Zayed Bin Sultan Al Nahyan always admired the significant role Emirati women have played towards United Arab Emirates’s development. He encouraged and supported them and made sure nothing obscures their way towards advancement. Emirati women still enjoy direct support from her successor, the President His Highness Shaikh Khalifa Bin Zayed Al Nahyan, who declared August 28th as Emirati Women’s Day. Her Highness Sheikha Fatima Bint Mubarak, has helped to create more women-friendly policies and opportunities for involving women in the public workforce. Women hold representation in government affairs and are appointed on important designations, for example, female ministers form 27 percent of the ministerial assembly. Involvement of women in advanced fields such as engineering, space sciences, technology, and medicine signifies their role towards the development of the country. Sheikha Maryam Saqer Al Qasimi is one of the most significant ladies from Emirates Royal family who is inspiring Emirati women and leading them with an example. Al Qasimi is one of the six ruling families of the United Arab Emirates (UAE). Much like other Royal Family members, Sheikha Maryam Saqer Al Qassimi was born and raised in UAE. She is a columnist at Al Roeya Newspaper. Sheikha Maryam is also a successful children’s author. Her notable work talks for itself and is a proof that she is a motivated woman who leads from the front. Despite being a member of the Royal Family and having a successful career as a published author at such a young age, Sheikha Maryam Al Qasimi is a very pleasant and humble person. Sheikha Maryam is currently doing her masters in translating young readers’ books. She has also published several reading books for kids. Her published work includes Curious Adam, Complete Together, Where Are the Letters?, Hakeem Al Arab and Saqi el Maa. She has been awarded Sharjah’s children book award 2018 – young readers genre in the English language. She has enjoyed the pleasure of one of her books, ‘Where Are the Letters?’ being adapted into a musical play. Maryam has conducted many interacting workshops to engage children with reading. She believes that reading books for kids is important and developing a reading habit early on is crucial to growth on the personal and professional level. 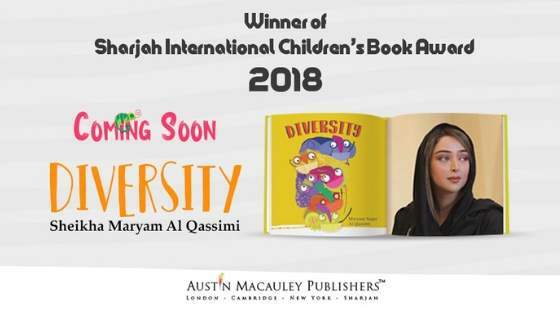 Austin Macauley Publishers is pleased to announce that Sheikha Maryam Saqer Al Qassimi, has acquired a contract with our publishing house for her next children’s book titled ‘Diversity’. The book is full of attractive colorful illustrations about chameleons. The book tells the tale of a village where chameleon lived together and decided to hold a competition of decorating an old tree. The message of the book is that diversity is the key to creating beauty and if different people come together and work towards a common goal the results could be extraordinary. The book is aimed to help children understand the meaning of diversity, generating acceptance of diversity and develop an appreciation of diversity in young readers as well as the overall society. Given that Austin Macauley Publishers was founded in London in 2006, it has recently expanded to United Arab Emirates (UAE) and to get the attention of a Royal family member is an achievement in itself. It shows the confidence of Sharjah market in the performance of the publishing company. Sheikha Maryam has shown keen interest towards getting her book published with Austin Macauley Publishers and has been involved in the publishing process. Austin Macauley Publishers’ staff shares that it has been a pleasure working with her, developing her manuscript into a book. Although, no confirmed date has been shared for the launch of her book ‘Diversity’, we know her book will be available in e-book format and paperback very soon in the market. A great response from the audience is anticipated and the masterpiece symbolizes great hopes for both author and the publishing company. The Sharjah Publishing City was the concept of Ahmed Al Ameri – the Sharjah Book Authority and the facility were opened by Sharjah’s ruler Sheikh Sultan bin Mohammed Al Qasimi. The facility has acquired the status of publishing hub of the Middle East and Austin Macauley Publishers was among the first publishing companies to be welcomed in The Sharjah Publishing City. So far, Austin Macauley Publishers has acquired a great response from the Arab market both from the authors and the reading community. 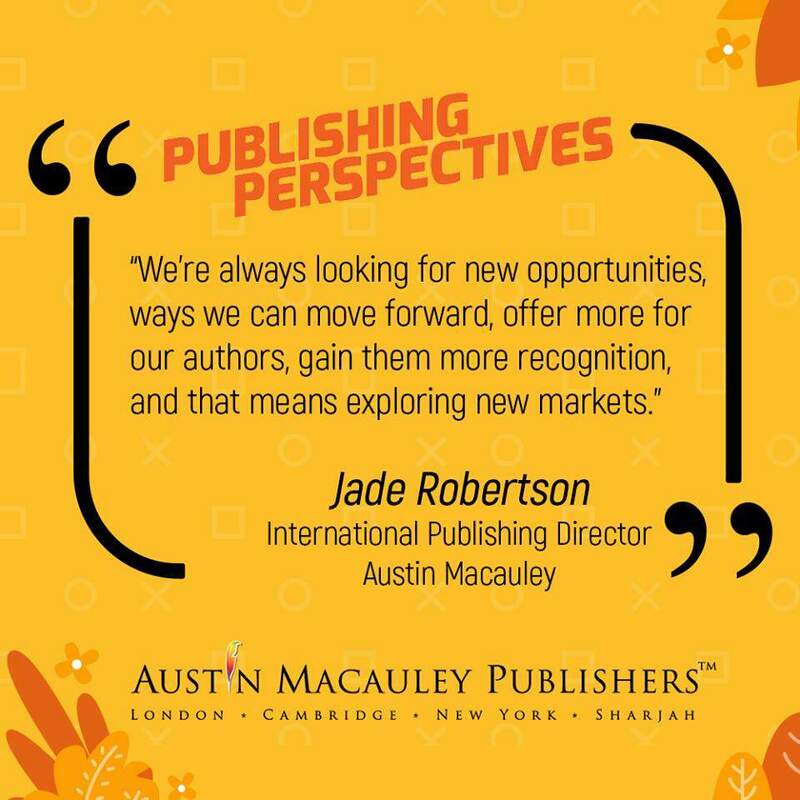 In her interview with Publishing Perspective, Jade Robertson, Director of Austin Macauley Publishers, has expressed that UAE has been a very receptive market. She highlighted the market for children’s book and passion of Arab kids reading short stories, emphasizing the demand she said ‘… These Arab kids, they are screaming for books…’. The publishing company is ready to take over the market and fill in the demand-supply gap. Talking about entering the Arab market she said: “Every country is different, but the team in Sharjah is well connected”. Robertson has also promised many great books, which are still in process, to come out in this year. Austin Macauley Publishers are keen to welcome all the authors working hard consistently with immense passion and enthusiasm to get published. It’s time for you all to begin your great story with the Fastest Growing Publisher.